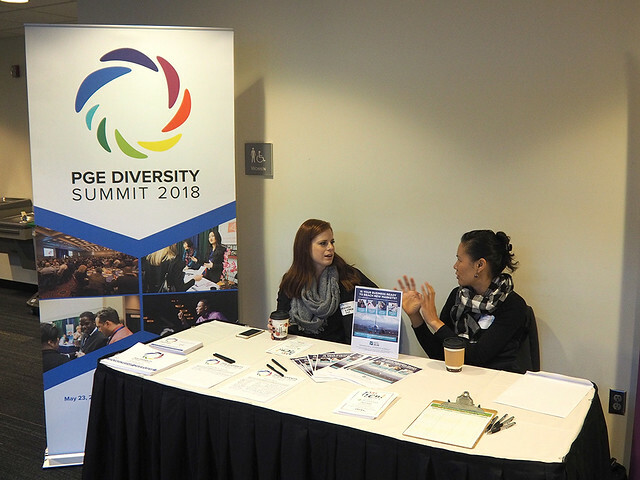 More than 70 business and public sector leaders joined Greater Portland Inc and Partners in Diversity Thursday morning for an event focused on creating a culture of diversity in the workplace. This was the third event in the 2017 Diversity in Leadership series of equity and inclusion programs organized under the Greater Portland 2020 strategy. The event was kicked off by keynote speaker Jim Piro, retiring president and CEO of Portland General Electric. He stressed that a culture of diversity and inclusion starts at the top – with the CEO. He said PGE has worked hard to weave both diversity and inclusion into the fabric of the business and embrace the value of all people. Diversity in the workforce isn’t just important for employees, Piro said, it is vital to a company’s bottom line. It allows a firm to better serve customers, improves decision making, and improves the feeling of safety that employees have in their work environment. Not having a comprehensive diversity initiative results in value being left on the table. Following Piro’s lead, a panel of experts on diversity, equity, and inclusion shared insights from their organizations. The discussion was led by Tamara Kennedy-Hill, the vice president of diversity and community relations for Travel Portland. Panelists included Shiau Yen Chin-Dennis, a partner at K&L Gates; Kurt Jun, the diversity and inclusion director PGE; and Dr. Steven Nakana from the Port of Portland’s social equity program. Chin-Dennis emphasized that diversity in values is just as important as diversity of color. Her firm has seen an increase in performance and revenue after diversifying its Portland office. Jun pointed out that successful business is all about having the right talent. “Talent doesn’t just come in one color. It doesn’t come in one gender. It doesn’t come in one anything,” he said. Nakana stressed the importance of breaking down barriers for minorities and inclusive programs because it benefits everyone, including the dominant majority. Following the panel, each table of guests were led by table captains to share details of the diversity programs their organizations are working on. The Diversity in Leadership series is a signature project for Greater Portland 2020. The regional economic development strategy seeks to establish economic prosperity for all through a focus on people, business and place. Our next event is our GPI Open House on January 29, 2018. Save the date! Explore our website to learn more about investing in GPI or becoming a Certified Ambassador.